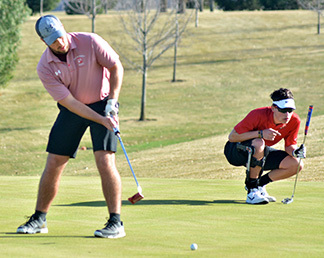 Windy — that’s the best way to describe the conditions as the South Winn golf teams hosted Turkey Valley Monday night. Not only were the two teams battling each other, they were also fighting 20 to 30 mph wind gusts that could have affected even the best golfer at Silver Springs Golf Course in Ossian. The SW boys bested the Trojans 187 to 209. The co-medalists were South Winn’s Brady Hageman and Braden Lensing with 46s. Tying at 47s for runner-up honors were SW’s Jacob Michels and Trojan Simon Schmitt. Freshman Trey Kriener rounded out the varsity scorecard for South Winn with a 48. Additional varsity linksters on the course for the Warriors were Brandon Frana (51) and Brekin Tigges (53). An errant tee shot on tricky hole No. 3 cost Turkey Valley’s Schmitt some strokes but he bounced back and played solid golf the rest of the way, according to the Trojan coach. Senior veteran Gabe Hoffert, sophomore Kalvin Langreck and freshman Jackson Vsetecka all shot 54s. Also on the course for the TV boys’ varsity squad were Garrett Kurtenbach (63) and junior Lucas Scheidel (67). In junior varsity action, South Winn was led by Shaun Klimesh with a 49. Logan Baumler came through with a 54 while Tayton Bullerman tallied a 59. Carding a 61 was Jason Kuhn. Jason Herold led the Trojan JV with a 65, while Brody Hackman was there for a 70. Shooting a 78 was James Schmitt. Others on the links for TV were Lance Schmitt (82), Matt Stammeyer (83) and Dani Tinajero (87). “Overall, I was pleased with how we performed the first time out,” said Coach Reicks. The South Winn girls completed the night by firing a 234. Turkey Valley toured the course with a 258. Medalist honors went to Allanda Kriener for South Winn with a 55. Makayla Hageman and Ruthie Frana shared runner-up with 58. Rounding the varsity scorecard for the Lady Warriors was sophomore Sydney Becker with a 63. Kaitlyn Theis also tallied a 63 with Presley Bushman rounding out the varsity line-up with 65. Scarlett Gansen was also on the course, carding a 59. TV was led by Marisa Mueterthies with a 61. Rachelle Smith had a strong performance with a 62. Kylie Wurzer came through with a 66, while Savannah Schmitt and Jaedyn Winter both had 69s. Emma Hanson ended up with a 70. Tess Franzen posted a score of 77 while Olivia Drilling added an 81.